I bought this lock to replace a heavy duty lock that was the victim of an attempted theft. no luck for the idiot that sheared the lockpin luckily as bike is anchored. this lock is excellent. easy to arm and disarm. looks the dogs which puts off idiots and fits nicely thru anchor. it's water resistant lock mech and is seriously loud. chain is heavy duty and it's YELLOW which all students of psychology will tell you is a primary warning colour. good protective sleeve and the right length for affixing to poles etc. like all locks you don't know until it's tested but I like it so far. For more than a decade, Kovix have been designing and manufacturing a wide range of intelligent security locks for homes and vehicles. 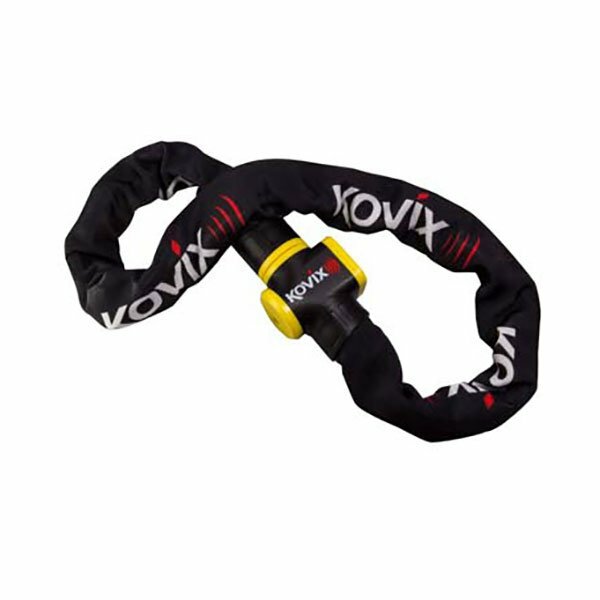 Combining expertise and know-how with the latest technology, Kovix focus on the development of every product based on customer experience. This has led us to create one of their unique product features - the ON/OFF alarm selection for alarm equipped locks. Hi, could you tell me the weight of the 1.5m chain? Thanks.